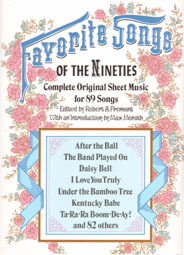 Sheet Music with lyrics for 89 hit songs of 1884 through 1906 . . . All are reprints of first or early editions of each song. These are the sing-along songs from piano bars of years past. Included are "The Band Played On", "I Love You Truly", "Daisy Bell", "In the Shade of the Old Apple Tree", and many more.